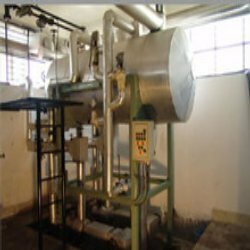 We are a leading manufacturer, exporter and trader of high quality L.P. Ammonia Receiver that exhibit exceptionally high performance on and find wide application in various industrial purposes. Furthermore, these receivers are manufactured using high-grade raw material and the latest technologies in compliance with set international standards. In order to provide defect free products to the clients' end, these are strictly tested on various parameters by our experts. Established in the year 2006, at Delhi (India), we, “Cool Tech Industries”, are the well-known manufacturer and supplier of Bank Tank, Cold Storage Door, Electrical Panel, Ammonia Receiver, Air Cooling Unit, Atmospheric Condenser, Oil Separator, Suction Trap and Trunk Coil. These products are designed and fabricated using the finest quality raw material, available in the market procured from the certified vendors of the market. We use advanced technology, latest tools and machines to develop these products in compliance with the set international standards. The offered products are widely acknowledged among clients for their optimum quality, reliability, durability and robustness. We are offering our wide range of products to our clients in various specifications as per their varied requirements. Our precious clients can avail these products from us at unbeatable prices.